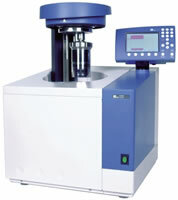 The C 2000 basic IKA calorimeter is a combustion calorimeter for determining gross calorific values of liquid and solid samples. A high level of automation with extremely simple handling characterizes this instrument. In addition to the isoperibolic measurement procedure (static jacket), a dynamic (reduced-time) working method is also available. To provide the calorimeter with cooling water, it needs to be connected to the IKA thermostat KV 600, which is included in this package. • The C 2000 basic is equipped with a very convenient console to operate the unit.